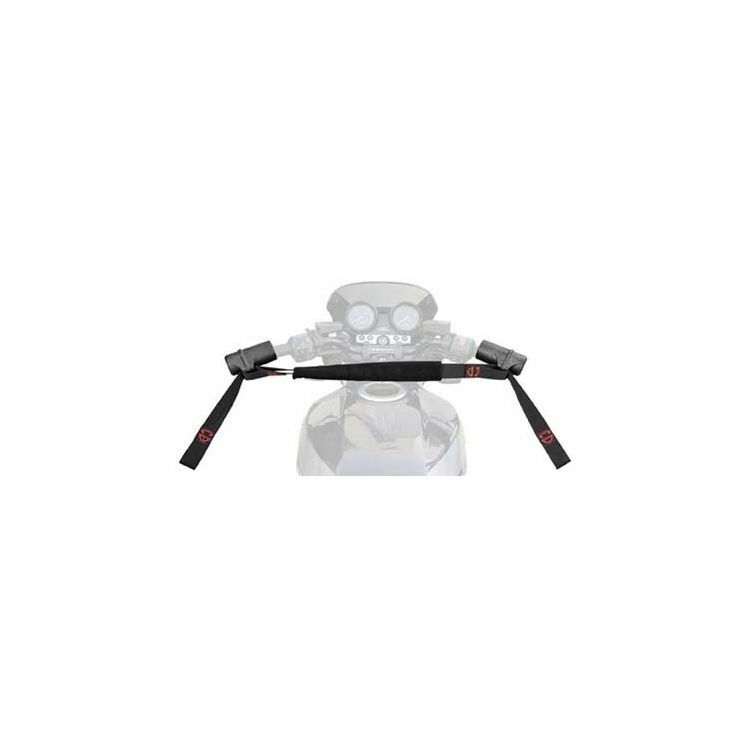 The Canyon Dancer Bar Harness 2 solves the problem of transporting your motorcycle safely. The Bar Harness gives you a place to attach your tie-downs that won't scratch your paint or interfere with the bodywork. Quick to install, the cups are made to fit over all sizes of handlebar grips, including heated grips. The cups are closed on one end to keep the harness in place, so they won't wiggle down the bars during transport. When you need to move your ride, rely on the Canyon Dancer Bar Harness II for the job. Note: Inches listed in size options represent the maximum handlebar width measured from end to end. This is perfect to tie down bikes on trailers or pickups. moving a new bike next week I want to take no chances, I want the best. I have found that full dress bikes can have issues finding a good location for tie downs. Using the bar ends helps keep the straps away from the plastic and the paint. Life saver. Really easy to use. To safely trailer my sport bike places. Very convenient. Recommended by other riders. Simplified securing my bike on my trailer. Just simply the easiest way to load the bike in the back of the truck and go! ease of use, first time putting a bike on a trailer, this made it so easy to take care of the front end. No brainer. This is the way to go. Seen this product on you tube and was highly recommended for trailering your bike. Better design and friendly design with bikes with farings. to transport Yamaha R1 and Hayabusa. worked great!!! Good way to keep the tie down straps away from my plastics, this is much cheaper than new paint. Finally, a decent option to strap down sports bikes. I've strapped down a bike in my truck at least 100 times and these are the coolest thing I've seen since sliced bread. Canyon Dancers are the standard in sportbike tie down harnesses, I like that these take the stress off the grips. Used them on a 2,400 mile round trip and had no problems. I bought this harness in order to trailer my FJR and Harley Softail without marking up the paint. It works really well. I use two other sets of strap while trailering my bike, one pulling the bike forward from the footpegs to the front of the trailer to keep the bike from moving laterally, and another holding some compression in the rear end to keep the bike from bouncing around. I would buy this again and recommend it to anyone. Worked well on a recent 2,ooo mile trip! Always looking for a more secure way to trailer my bikes. I like the fact that these are high on the bike for better stability. I hope the work as good as I imagine they will! I've been mooching a set of these from my buddies forever; I thought it was time I man-up and got my own. I needed an easy way to strap down my sports bike. I saw lots of riders using these at a track day and had to have it. It works beautifully!! Going to my first track day at Sears Point / Infineon / Sonoma / whatever they're calling it these days. Heard these were great. Several friends use them for Track days. They are the best thing I have seen on the market. Recommendation from a friend. Keep in mind, doesn't work too well on narrow handlebars and not at all if you have handguards or bar-end mirrors. What is the sizing specifically? I have a GS500 with clip-ons and a standard cbr600rr, will I be fine getting the sport/standard for both? Yes. I bought the harness and use it on my kawi 636 . The ease of use and quality are superb. Makes supporting the bike easy and secure. What size will fit my 2013 suzuki hayabusa? Yes, chose the size that matches you bar width, otherwise it is a universal fir. It works great! Will the sport/standard 32" fit 2013 cbr250r? BEST ANSWER: Yep I use them on vintage vespas and my Klr 650. What size Canyon Dancer Bar Harness II fits a 2013 Yamaha YZF-R1 best? BEST ANSWER: 32" is what I bought for my S1000RR so should be the same for the R1. Best investment I've made when it comes to towing products. What size for a Superduke 1290? Thanks in advance! BEST ANSWER: I purchased the 32" for my RT with a 31.5" bar spread. The manufactures Website states that their webbing us all fits 1 to 1.5" over. will the hard cuffs (cups) on a canyon dancer 2 fit over a throttle boss on the grip ? BEST ANSWER: I don't know what a throttle boss is. I this product to use when I trailer my Multistada and it works far better than the older canyon dancer. The new one is a quality product and you won't be disappointed if it fits. My suggestion would be......measure the throttle boss then compare it to the diameter of the canyon dancer. Which size would I need for a 2013 Ducati 848 evo? 32"? Thanks for the help. BEST ANSWER: I've got the same bike, 32" works great. I was wondering if the short version will fit a 2013 Aprilia RSV4? It seems the bar length is 29". Please advise. Thank you for your time and attention to this matter. BEST ANSWER: I have the Sport/Standard 32" which works great w/ my MV Agusta F3 800. I suggest getting the same for the RSV4. which size do I get for a Honda 17 Goldwing and a 2011 z1000 Ninja? I have a buddy 125 scooter with a 25" handlebar width. Will this product fit? BEST ANSWER: This product should fit, the cups get really close, I believe the only thing that stops the cups from touching is the felt piece in the middle.